I have developed a serious case of muffin envy. My local market has a pretty incredible bakery section that I like peruse for research purposes. From decadent cakes, fresh breads, doughnuts and pies – it’s enough to bring this carb addict to her knees. Although the entire bakery is filled with utter brilliance, I’m always drawn to the glass case that is home to the big, beautiful muffins. It’s not even the flavors that lure me in, it’s those glorious risen crowns that are baked to golden brown perfection. You know exactly what I’m talking about, don’t ya? Admit it, you’ve fallen victim to muffin envy – haven’t you? Every single time I peer into the meticulously shined glass that separates me from amazing muffin world, I think to myself – why can’t I do that at home – on my my own turf – with my own flavor combinations? Well folks, I don’t have an answer for you. I’ve read about, researched and tasted more muffins than I care to openly admit. But sadly nothing that I create in my own kitchen compares to the muffin bliss that stares me down every single time I enter the market. So instead of dwelling on what may never be, I choose to embrace the homemade, rustic muffins that I create in my own kitchen. And today I have an incredibly tasty sour cream muffin bursting with fresh blueberries and the tart zing of fresh lime zest. They’re perfect for breakfast, lunch or simply a midday snack. On second, thought, maybe I’ll go all undercover and apply for a muffin baking apprenticeship – ya know – for that aforementioned research! Tell me, what’s your favorite muffin flavor? Preheat oven to 400 degrees F. Spray muffin pan with nonstick cooking spray or line with paper muffin liners. In a small bowl, combine sugar and lime zest. Mix with clean fingertips until sugar is moistened and fragrant. Set aside. In a medium bowl, stir together flour, salt and baking soda. Set aside. In large bowl, beat eggs and sugar until thoroughly incorporated. Continue beating while slowly pouring in the oil. Add in vanilla. Stir dry ingredients into egg mixture alternately with sour cream. Gently fold in blueberries. Scoop batter into prepared muffin cups and if desired, top with a sprinkling of coarse sugar. Ooooh, never seen LIME added before! GENIUS! Yeah! How do the bakeries get their muffins so mammoth and perfect??? I toohave never been able to recreate that! Yours looks perfect! I love banana muffins.. not banana nut muffins, but just plain banana! Love your blueberry lime muffins! Lemon and blueberry together are a favorite combination for me, so why not lime and blueberry. It’s an interesting twist – thanks for posting the recipe, and great photos!! Yes, I too get muffin envy, more often than I would like to admit. I mean common-seriously-those supermarket muffins are like gold! I think that all supermarkets are in on the secret of how to make a muffin with a perfectly crispy crown and soft bottoms. It’s so unfair. My favorite muffins are probably chocolate chocolate chip. They have the best tops ever and I can never say no to those jumbo muffins! But there were these muffins my grandma bought a few months ago. They were cinnamon and those were probably the best muffins I had ever had, hands down. They were delicious! Beautiful I must make them, last week I made the Lemon Muffins with the creme cheese frosting and oh my gosh they were Devine. 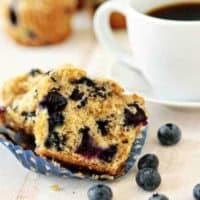 Hi, my favourite muffin has to be lemon & poppy seed muffin, but I also love blueberry. Yours look lovely. I sometimes drive 20 minutes to the food co-op just to get a muffin. They have the biggest and best muffins in my area, my personal opinion :) My favorite flavor is the cranberry! LIME!!!! I thought I smelled LIME! – Amazing the internet right? It may just be one of my favorite foods EVER, plus it’s my favorite color. Ah green. Don’t you just love the color green? The best thing about muffins is they are so versatile. You can do practically anything with them and rarely have a dud. Well unless perhaps you made like blueberry and liver gizzard muffins. I don’t think that would go over very well. The pieces of blueberry inside are big! Love how the fruit pieces and the drier spongy cake balance out nicely. These “rustic” muffins look beautiful! I have never thought of using lime with blueberries. I think I know what my next batch of muffins will be! I too have given up on getting my muffins to have that perfectly risen crown that you find at the bakery. I tell myself it’s got to be the tons of butter they use. 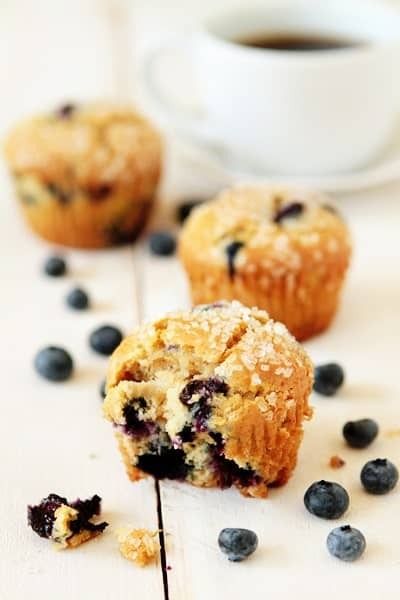 I just love the combination of blueberries + lime, and in a muffin nonetheless…SWOON! Those look amazing–love the addition of the lime! And I think I prefer the more “rustic” look to the perfect store made ones–who knows what they had to put in them to get them to look like that! THIS might just become my next favorite muffin! Love the idea of blueberry and lime! My favorite muffin is chocolate banana with a spoonful of peanut butter inside. I also love blueberry and I think the lime would be really good too. Kinda tropical. Now I’m hungry. Love the flavors in these muffins! I wish I could find coarse sugar around here. It looks like a lovely topping! Do you have a Michael’s near you? I got my coarse sugar there in the baking department – it’s Wilton brand. Sugar in the Raw is coarse sugar, however it is brown, but still gives that pleasant cruch to the top. I get mine at Wal-mart. Made these this morning and they are the BEST! I’d attach a photo if I knew how..thanks for the recipe! So glad you enjoyed them! Thanks so much for reporting back! That looks simply delicious Jamie! We have abundance of key limes here in Florida. Bet that would work as well? I have a thing for blueberry muffins and the addition of the lime is sounding so delicious! I will have to try this for my next batch of muffins. I’ve always loved cranberries in muffins. Cranberry-blueberry, cranberry-lemon, cranberry-orange, whatever it may be! I love those tarty berries! Looking at your amazing photos, there is no reason for muffin envy…. As for what type? I’m a purist – I like blueberry muffins. I love a good blueberry muffin…though gingerbread are pretty yum too! Agree – the addition of the lime is genius. Printing and baking asap :-). Ah. Muffin envy. Been there! Great looking muffins. Love the sugared topping. Yours look beautiful! I love blueberry muffins the most. I would probably not have come up with blueberry and lime as a combo, but reading this recipe and looking at your final product, I must say it sounds utterly wonderful! I made these this morning and they were wonderful! Jamie do you have a recipe for a crumble type topping to add on the top before baking? Thank you for sharing. 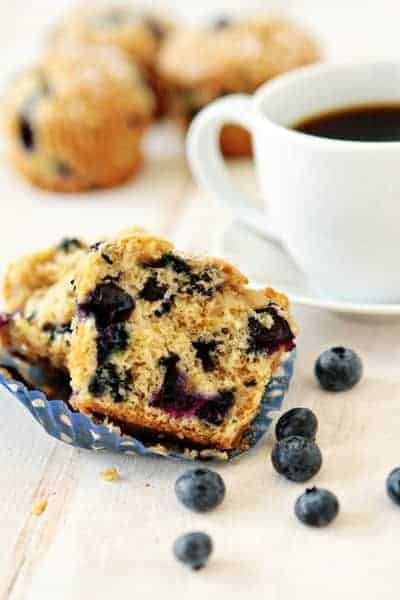 These blueberry muffins were a wonderful hit at my house. Your blog has saved my sanity this winter. I live in the northern Alps where it is still cold and snowy. When I’m going stir crazy, I just check out your site and then it’s off to the kitchen. Thank you so much for so many wonderful flavors and ideas! I used raw cane sugar for the topping and it was great! I love your adaptation! Thanks so much for stopping back and letting us know how the recipe worked for you. Thanks, Sommer. It looks like it’s already been removed. Have a great day! Made these yesterday, and they were the best muffins I ever made!! Love the lime sugar, really distributed the lime flavor!! Also, the batter was not thin, so the blueberries did not sink to the bottom. They were beautiful and delicious! Thank you!! I used to in a c-store that had a bakery section. The key to the muffin top mountain is the big crystal sugar. Pile that on! The “bread” solidifies around them so that when rising the tops will go higher rather than wider because the sugar crystals hold it together instead of the top sort of crackling or spreading. At least that’s what the boss lady told me and ever since those very sugar crystals have become a staple in my kitchen. Gonna go try this recipe right now!